Welcome to the Word Vector SEO Guide! For many of you, Word Vector may seem like a new term. But, do you know that the probability of us using Word Vectors in our businesses are getting higher each year? The truth is if you’re doing any kind of Internet marketing, having a basic understanding of what Word Vector is and how it works can help you achieve greater success in your SERP battles. To help you in your journey to success, we’ve put together a Beginner's Guide To Word Vector in SEO designed to show you in a better way on how Word Vector works, why you should be using it and what tool you can use to analyze, track and improve your content rankings. We would like to note, however, while this post won’t turn you into a Word Vector pro overnight, we promise it will be full of resources that will make your understanding towards this a tad bit better. Fret no! Let us send you the definitive PDF copy so you can read it anytime. If you’re up-to-date with the progress in Natural Language Processing (NLP) research, you’ve probably heard of Word Vector or Word2Vec. First things first, NLP is human’s attempt to make machines understand our human language. It is a machine learning tool and capability that we have available because of big data. Now, big data has exploded over the last couple of years, and now we can leverage that data to understand text as we’ve never understood before. When we talk about Natural Language Processing, there are a lot of different tasks that fit under this umbrella; question answering, machine translation, sentiment analysis, document summarization, and the list goes on and on. To those of you who are still new to this, NLP has seen huge progress lately. Today’s search engines are smarter than ever and using NLP can allow a better grasp on user intent and deliver more targeted results. One of the most popular recent techniques is the use of Word Vectors (or Word Embeddings). But before that, what is Natural Language Processings impact on SEO? Well, one of the most significant impact it has with Google is using NLP to understand the web and website assets better. Websites are going to rank differently as the algorithm can better understand sites and categorize these different pieces of content. Kudos to you who has guessed it right! It’s TEXT processing. The two scenarios deal with humongous amount of text to perform different range of tasks. See, humans can deal with text format quite intuitively but if we have millions of documents being generated in a single day, it is certainly unworkable. Neither is it scalable or effective. But when humans and computers come together hand-in-hand, everything seems possible. Computers should understand natural language better, so people can interact with them more easily and get on with the interesting parts of life. So, how do we make computers of today efficient in handling and processing texts for fruitful outputs? How do we make computers tell you about football or Ronaldo when you search for Messi? The answer to the above questions lies in creating a representation of words that capture similarities or relatedness of ideas and language. And all of these are implemented by using Word Vectors so that computers may handle them. How Does Word Vector Work? Word Vector is an AI model pre-trained by Google. It has established itself as an integral part of the NLP models. The primary usage of a Word Vector is to grasp something about what they mean by how they relate to each other. It may be weird when you think about it, but Word Vector helps us solve very sophisticated tasks in NLP. It is an algorithm that helps Google learn about the relationships between words, based on examples of actual language usage. 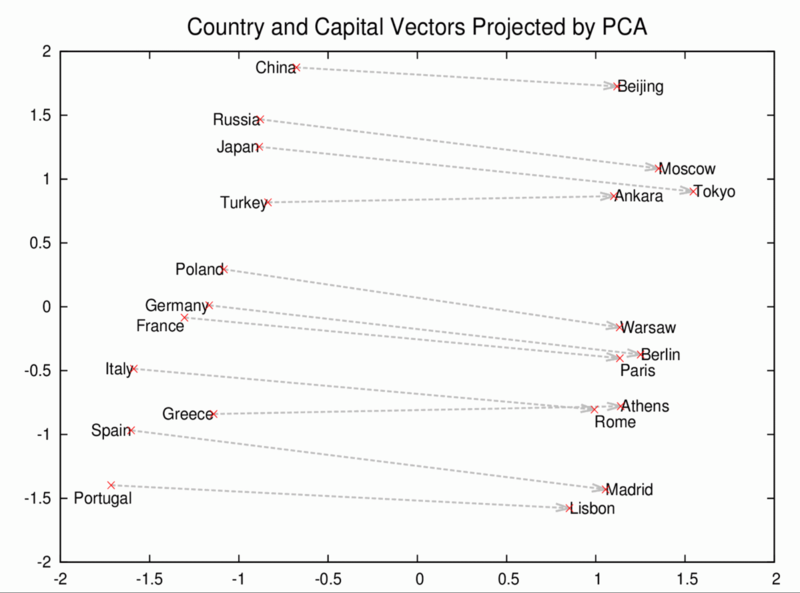 The popularization of Word Vectors can be attributed to Thomas Mikolov and his team from Google in 2013. He created Word2vec, an open source model that aims to learn the meaning behind the words. Now, through Word2Vec, a concept was formed: If two words appear frequently in the same context, they should be represented by two nearby vectors. For example, think about the basic setup for an analogy: A is to B as X is to Y or husband is to wife as king is to queen. Now, isn’t this very complex for a machine to understand? How do machines encode information about how a husband and wife are related? How do we discover the difference between regular and royal couples? And how do we determine the commonality in some phrases? This is where Word Vector comes into place. Using Word Vector, we can analyze the vectors’ relative to one another and make comparisons. A simple way to investigate the phrases is to find the closest words for a user-specified word. The distance between words serves the purpose. Word Vectors typically have around 200 dimensions, meaning each word gets a position in a 200 dimension space. Placing words in a multi-dimensional vector allows us to perform similarity comparisons, among other operations. The husband and wife word vectors will be oriented in a specific way, with a given distance from each other. A similar orientation can be observed between the king and queen word vectors. Just like Indian + Curry = Indian Curry, a similar elementary operation will allow us to understand how concepts can “mesh” to create new ones. For example, we might add the vectors for man and royalty together. You can probably guess that man + royalty = king. Let’s look at another example, one that is provided by Google themselves. According to Google Open Source blog, it is said that the Word2Vec model understands Paris and France are related the same way Berlin and Germany are (capital and country). Oddly enough, it is able to grasp that Italy and Beijing are not related by any means, without human supervision! All it requires for such an incredible output is just by reading and feeding in lots of news articles. The chart above clearly shows how well it learns the concept of capital cities. In one of the post by SEOPressor, there was an illustration of the processing pipeline for Word2Vec. If you’re interested to know more in detail, take a look at the breakdown of how the algorithm works in the simplest manner. We hope this explains why these vectors are useful in most use cases. Of course, the quality of your derived Word Vector depends on the amount of text fed and if is properly encoded. But for now, let’s delve in how Word Vector is going to impact SEO! How Word Vector Impact SEO? Google has reached a level of data size and processing capability, at which they’re able to make almost daily updates to their algorithm(s). Machine learning will only accelerate that development. Machine learning is only used in small, specific use cases for organic search but its usage seems to be growing quickly. Our hypothesis is that it will open many doors for Google and transform search in general. If you’re attentive to the SEO industry, you’ll notice that many SEO specialists and marketers have sparked opinions that Word Vectors may determine the ranking of a website. Over the past 5 years, Google has introduced two algorithm updates that put a clear focus on content quality and language comprehensiveness. Let’s take a step back and talk about the updates itself. In 2013, Hummingbird gave search engines the capability of semantic analysis. By utilizing and incorporating semantics theory in their algorithms, they opened a new path to the world of search. And in 2015, Google announced Rankbrain, which marked the beginning of Google’s Artificial Intelligence (AI) first strategy. 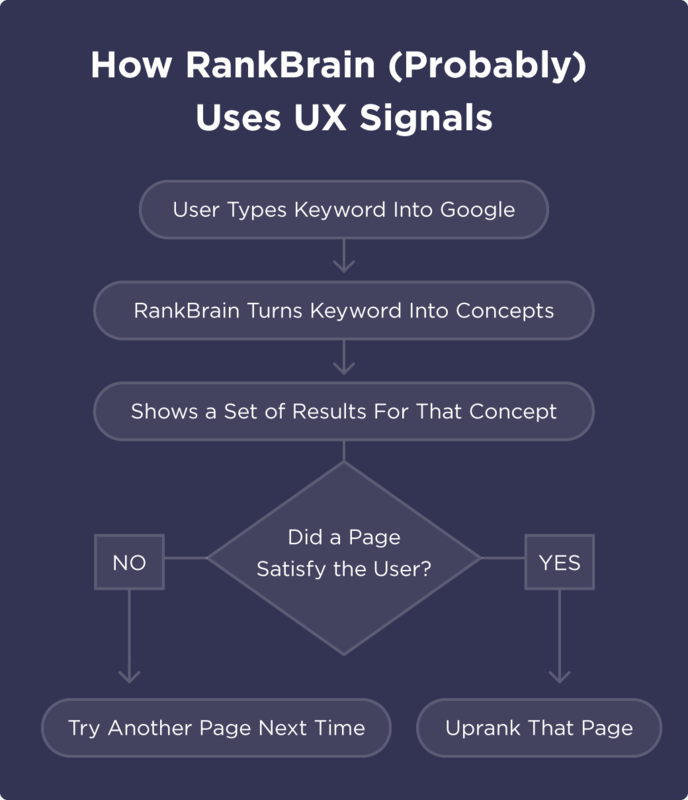 Simply put, Rankbrain is an algorithm that helps Google break down and understand complex search queries. You can say that Rankbrain translates search queries from “human” language into language that can be easily be processed by Google. This also means that Google has began using multiple AI-driven techniques to rank search results. The thing is, why was Rankbrain created in the first place? As you can see, these updates has caused SEO to shift focus. Keyword research is still important, but the role has changed. Simply put, AI systems can now understand way beyond individual keywords. Much like humans do, new systems like Word2Vec can understand relationships between topics and develop a contextual interpretation. So, it’s safe to say, without implementing the correct word vector, you are less likely going to rank on the first page of SEO. 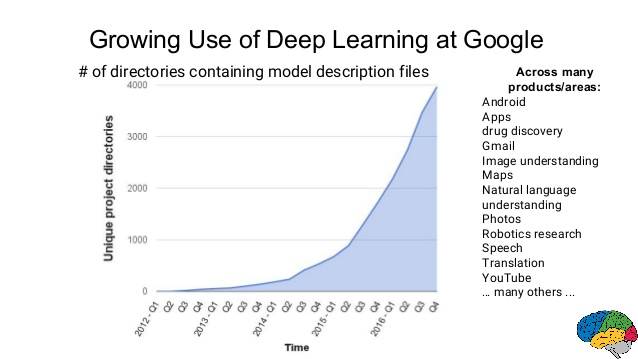 Jeff Dean, the main man of Google AI, mentioned in one of his videos that he sees exponential growth about deep learning (a subset of machine learning) starting in 2014. With this piece of information, we’re basically at a tipping point at which it’s important to understand what’s coming at us so we can adjust and reposition ourselves in the right manner. To stay on top of SEO and still be successful in 2020, make sure to get the user intent right, measure mobile-first, and have a close eye on your industry. We hope it’s clear to you now on how Word Vector can impact SEO in the long run. *In the link below, the team from SEOPressor has featured Word Vector in their blog, if you’d like to know more on this. How Can I Rank With Word Vector? Assuming you have an already-published amazing content out in the battlefield. Despite it being polished over and over again, it still doesn’t fetch any positive results to your rank nor traffic. You think to yourself why is this happening to you? Well, it could be because you didn’t include Word Vector, Google’s AI model. How can I find the accurate Word Vector to be included in my content? Primarily, you will need to figure out the Word Vectors of the Top 10 Rankings in SERP, especially those of your niche. You need to know where your competitors are using their main keywords, and what are those keywords they are targeting that you might be missing out. By applying the Word2Vec formula based on advanced Natural Language Processing Techniques and Machine Learning framework, everything will be revealed to you. So, your answer to everything above lies in WordGraph, the world’s first intelligent Word Vector Tool. 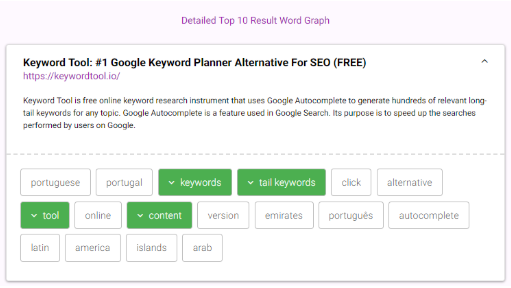 WordGraph is designed to tackle the exact search matching for the closest words around the user’s specific seed keyword. 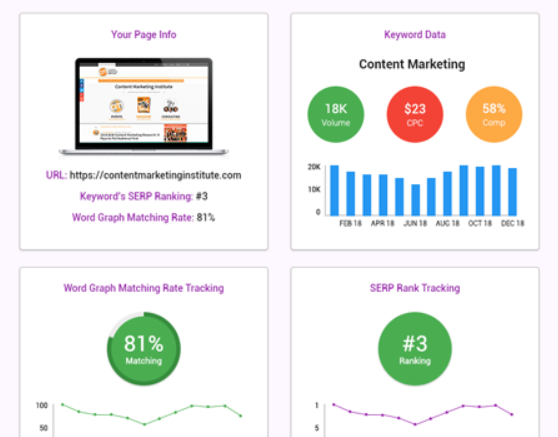 WordGraph is powered by a Word Vector Technology based on AI, designed for you to analyze and improve your content relevance against top 10 ranking by targeting precise yet profitable keyword composition that you need to rank. It analyzes the content gap and suggests the best keyword composition to rank your website higher, making the website optimization process effortless. What’s even better, you can almost instantly uncover your competitor’s keywords and see what makes them rank in the first place. Moving on, let’s look into how you can rank your content using this tool. Step 1: Enter your main keyword & domain (URL) and generate Word Graph for your site. Step 2: View the Word Graph of your site and the top 10 sites. Evaluate the keyword matching rate and score metrics. The lower the percentage, the more effort you need to put in to outrank your competitors. Step 3: Identify the keywords lacking on your website. Green means you have the right keyword in your content. Grayed out keywords indicates the keyword is lacking in your website. Step 4: Head back to your published content and use the keywords in your content. Since Word Vector is not as straightforward as keyword matching, the optimization will need a little bit more of pushing. The Matching Rate Score as you can see in the tool is an overall measurement of your keyword percentage and your competitor. The calculation is based on Mathematical approaches and AI algorithms. The percentage ranges from 0 -100%, with 100 being the best, and 0 the worst. The lower the percentage, the more effort you need to put in to outrank your competitors. It’s always better to have an overall score of 88% than 60%. To improve the matching rate, the suggested keywords need to be used in the vicinity of your main keywords. Try to use them naturally for at least twice to improve the probability of getting picked up by search engine. 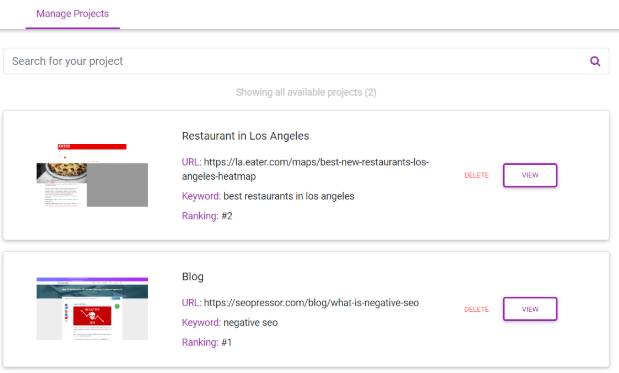 If you don’t know already, you can also analyze, track you/your competitor’s keywords and improve your content after publishing! We’ll show you how next, so stick with us. How Can I Monitor My Word Vector SEO? Alright, say you have used the keywords suggested in your content for search engine ranking success. How can you tell whether you’re achieving the results that you wish to see? Surely, you’ll need to know how to monitor your website rankings and SEO progress. As marketers, it’s incredibly important to always monitor your SEO performance after all the changes that you have implemented to your site. Doing so allows you to decide whether to keep on doing what’s working and adjust what isn’t. Knowing the pages that rank higher or lower in search engines is a good way to see whether you have done the right thing in your SEO strategies. A pat on the back for those of you who are already using some rank tracker tool to monitor your progress occasionally, then you are one step ahead of anyone else! Just in case you haven’t done so, you may consider letting WordGraph do the hard work for you! 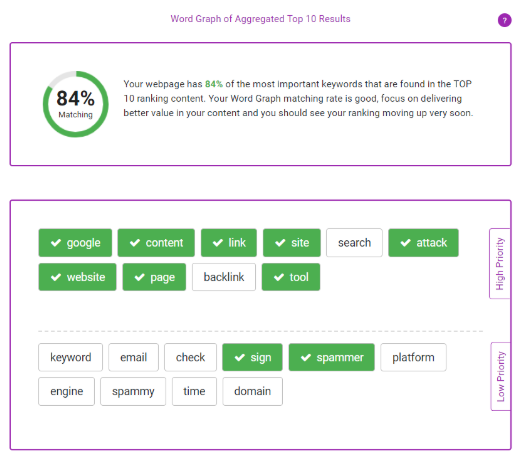 By using WordGraph, you can easily have the access to monitor your ranking performance. To monitor how your ranking changes over time, we suggest that you use the Project Manager feature. It will help you store and monitor the performance of your websites. Note: We’ll show you some basics, but be sure to explore the tool itself. What you need to do is just save the keywords that you want to track. Then, just head over to Manage Project and check the project that you have saved. Fully utilize the tool by Keeping, Saving and Tracking different keywords in your Project Manager. Over time, you will learn where you are making progress and also evaluate your performance. In other words, this means you can now spend less time pulling data and more time on optimization. If it is the first day you saved your project, you will see something as seen below. Once you used the suggested keywords by WordGraph in your content, the Matching Rate should reflect the changes that you have made and the same goes to the ranking over time. Getting the most out of Word Vector doesn’t have to be complicated. Simplicity was the one drive behind creating the WordGraph. What are you waiting for? Try the tool for free now! Now that you know what a Word Vector is and its importance, what are you doing that isn’t moving the needle? Clearly, understanding Word Vector will make you both more effective and more efficient with your organic search strategy in the long run. If you can take one thing away from this guide, it’s this: More than anything else, if you want to rank better, create the opportunity with Word Vector that shows Google your page content is accurate, precise, and trustworthy regarding the topic at hand. Don’t Have Time To Read Now? Save this comprehensive Word Vector PDF guide to read later!